Sometimes when I hear about Southern recipes I’m a little taken aback. For instance, Chicken Fried Steak is always credited to Texas, but in Iowa where Germans settled enforce in the 1880’s, where excellent beef is raised, Chicken Fried Steak seems to have always been a farm table and Diner specialty. Makes sense that they would make their Schnitzel out of beef. Or out of pork, like this Iowa Pork Tenderloin Sandwich. But Southern Tomato Gravy, it seems, is truly a Southern recipe. And that makes sense, with their longer growing seasons and what I imagine, an abundance of tomatoes. And it probably doesn’t really matter how and where Southern Tomato Gravy came from, I just always find the history of any recipe to be interesting. What’s important is that Southern Tomato Gravy is truly delicious and a great way to put to good use the end of summer tomatoes that come so fast and furious in the late summer heat and in the last weeks before the first really hard frost. It’s served over rice, over bread or biscuits, maybe even grits. Sometimes it’s a sauce over meatloaf or chicken. As a matter of fact, the sauce on this recipe for Chicken Bordeaux from the New York Times Cookbook, circa 1970’s always reminded me of Southern Tomato Gravy. Granted there’s wine and mushrooms in that recipe but take a peek and see if you don’t think so, too. So all that brings us to how to make Southern Tomato Gravy. So many choices and possibilities! As mentioned, start with the drippins’ or if you must or if you want to go Vegetarian, butter, or oil. And add an equal amount of flour just to form a roux and give the sauce a little body. Use two tablespoons of each if you’d like your gravy thinner, three tablespoons to make it a bit more substantial. From there, it’s time to think about the tomato part of the sauce. Do you want your tomato sauce smooth, chunky or a combination? And are you going to rely on all fresh garden tomatoes (you’ll want to peel & seed them) or canned or a combination? Do you want your sauce to be piquant and full-on in your face tomato flavor? Add a little tomato paste to boost that tomato flavor right after the roux is made. Or maybe you want to tone down the potentially acidic flavor. A pinch or two of sugar, a drizzle of milk or cream at the end will do the trick. And of course, you’ll want to think about any flavorings. 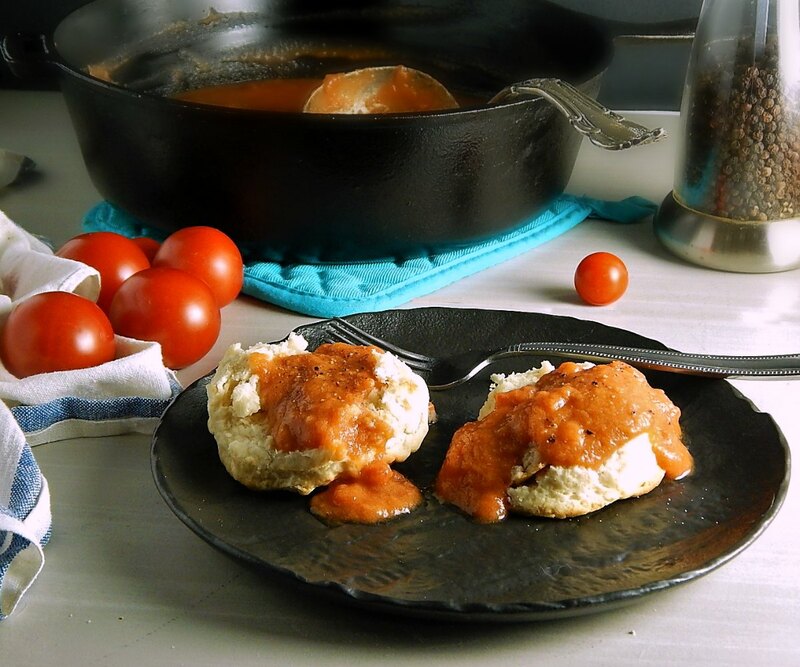 Do you want your Southern Tomato Gravy just as God intended (so I’m a bit prejudiced, lol) plain, relying on the drippings and tomato to bring home the flavor or do you want to go fancier? Maybe you’d like to add some onion or garlic, sauteed in the drippings before the flour is added. A pinch or two of your favorite herb. Maybe thyme, celery seed, a pinch of red pepper, You couldn’t go wrong with a squeeze of lemon or a dash of vinegar or maybe a touch of Sherry. And you’ll never want to forget the good black pepper, both in the Southern Tomato Gravy and over the top, freshly cracked, generously, when it’s served. While this dish has a history of being a “cheap” meal, maybe served after the war, and certainly, in the Depression, tomatoes are always super pricey at the store and they’re just a bit of a gamble. Seriously, you can never rely any longer on looks. Those little fancy vine-ripened tomatoes look like a good bet, even if they cost an arm and a leg but you get them home and they taste like nothing. Plum tomatoes used to be a good bet, flavor-wise until they became wildly popular and the flavor went by the wayside, just like with the larger tomatoes. So it’s always nice to grow your own if you can. Gardening isn’t feasible for some and even when it is, starting a garden isn’t a cheap proposition. There is a kind of break-even point in labor and materials including fencing if needed and supplementing the soil that no-one seems to talk about. Either keep your garden smallish and focus on the expensive veggies or make it much larger and grow everything you can, from seed. When I was at my Dad’s the last couple years, we used to joke about the first few tomatoes, until they really started coming in and we could no longer keep track. We’d say, “Look, look – it’s a $30.00 (or however much we had put into the garden that year) tomato.” The second one, of course, would be a $15.00 tomato and so on. I’m kicking myself now for not doing more to get my little garden in shape this year now that I’m home. If you have leftover Southern Tomato Gravy, thin it down with more milk and/or chicken stock, maybe a dash of Sherry and refashion it into good old Tomato Soup. No one will even guess it’s leftover. The Biscuit Recipe I used here is on my post for Classic Biscuits & Sausage Gravy. In a large frying pan, heat the bacon drippings until hot, using 2 tablespoons if you’d like your tomato gravy on the thin side, 3 tablespoons if you’d like it a little thicker. Add the flour, 2 tablespoons if you’ve used two tablespoons of drippings and three tablespoons if you’ve used three tablespoons of drippings. Whisk, forming a roux. Cook for a minute or two, whisking until it becomes a blonde color. Add the blended tomatoes, all at once, stirring. Add the chopped tomatoes and their juice. Simmer for several minutes until gravy is thickened to your liking. Add salt and pepper to taste and sugar to taste if the sauce seems acidic. Remove from heat and add cream or milk. Serve over good bread, rice, grits, biscuits, chicken or meatloaf, with an additional grinding of pepper over the top. There’s no need to make a fuss skinning just the two fresh tomatoes added to supplement this Tomato Gravy, but if you’d like to make this with all fresh tomatoes, you’ll need about two pounds and you will want to skin and deseed them. Cut a small shallow X on the bottom of each tomato and drop them into boiling water for about a minute. Scoop them out and plunge them into very cold water. The X will lift up a bit and the skin peels easily off. Deseed them over a strainer placed in a bowl so you save all the juices for the Gravy. You may need to add a bit of tomato juice to get the desired consistency. I’ll be sharing Southern Tomato Gravy at Fiesta Friday 236, hosted this week by Julianna @ Foodie on Board and Debanita @ Canvassed Recipes. Stop by and take a peek at their sites. You’ll love Julianna’s food – everything she makes has a special touch that takes it over the top. I’ve only just began exploring Debanita’s blog, but the scope of her recipes is outstanding! You never know what you’ll find. This entry was posted in Click here for Bargain Meals, Click here for Fabulous Food Posts and tagged canned tomatoes, Southern Cooking, Tomatoes, Vegetarian Meal. Bookmark the permalink. Perfect for the rich tomato time of year Mollie– and it does seem really versatile. You are so inventive!! How’s your summer winding down?? We’re just back from camping in Sequoia. Loved it but good to be home. hugs hugs! What a fun camping trip that must have been! There’s something about the Sequoias – just being there (and I;ve only been once) made me feel so peaceful. Like another world. Do you camp in Minnesota?? I’m picturing crystal lakes and beautiful green forest! WE haven’t done it much lately, but I think with grand-kids we’re getting back into it. hugs Mollie! My last camping trip was in Lanesboro in Southern Minnesota along the river in 2015, that was when I thought, heck, I’m halfway to the folk’s house I might as well go the distance. And that was when I saw just how bad of shape they were in…so maybe they’ll be more camping in my future, 🙂 I don’t even know where my stuff is, lol!! Hi Mollie– there’s something so elemental about camping (like little or no internet)– even washing dishes or fixing food is more fun out under the trees. We are hoping to do it again next summer now that we can drag the grand-kids along. And– haven’t heard about your parents for quit a while. How are they getting along there?? (I know they miss you cooking!) hugs Mollie! I think food tastes better when camping, plus it’s usually fun because it becomes kind of a communal thing, right? The folks are doing great – they were all worked up about the primaries because they watch a lot of tv and politics are a favorite topic of theirs. They literally will sit watching the updates for hours! Well, there’s a lot to be worked up about these days! hugs! lol, and Thanks!! I think it might be the quintessential summer tomato recipe! HYes, thank you, it hit the spot! Oh, I bet it would be good! My bacon was long gone and I just had some drippings in the fridge in a jar. But how I wish now I would have had bacon to dip! So interesting about your Mom making this recipe! That might give some hints as to the actual origin! I posted my version (an adaptation of my mom’s with the use of the tomato juice) a while ago. I’ve never run across this one, but it’s similar to the ingredients in what we called Texas Stewed Tomatoes. Only major difference is the the Texas version isn’t puréed and no flour but stale bread. I love similarities in recipes from various areas. FYI, I was raised in Texas, live in Sweden. I have seen a lot of older recipes thickened with stale bread. It goes to show how thrifty our parents and grandparents were! I get a kick out of the similarities, too, and the way certain recipes migrate! Or used to, anyway, before the Internet! I have never heard of it either and I lived in Texas for many years. Yup, need to give it a try. Jeanne, you won’t be sorry! 🙂 Especially if you have good tomatatoes.